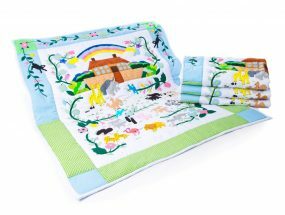 This gorgeous ABC Animal pastel baby quilt is by far our best seller and will surely become a family heirloom. 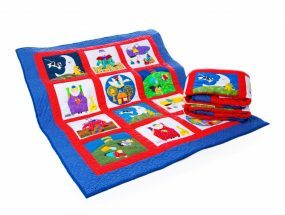 Each letter has an appliqued animal beside it and the border has a lovely collection of different fabrics to make up a patchwork design. It doubles up as a Playmat to put on the floor or a wall hanging to put on the wall. It also looks lovely on a single bed. It measures 115cm x 90cm and has a polyfibre filling. 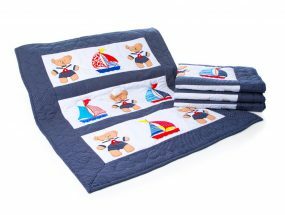 This beautiful ABC Animal pastel baby quilt is a work of art. The letters and animals are appliqued onto the material and then handquilted around. The border is a series of different patchwork materials. 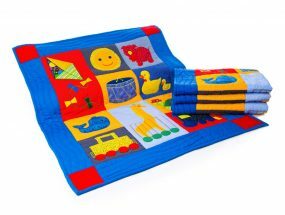 As with all our baby quilts these have been made for us by a very talented group of ladies in the Philippines that we have been lucky to work with for many years. Packaging: Sealed in a plastic bag.